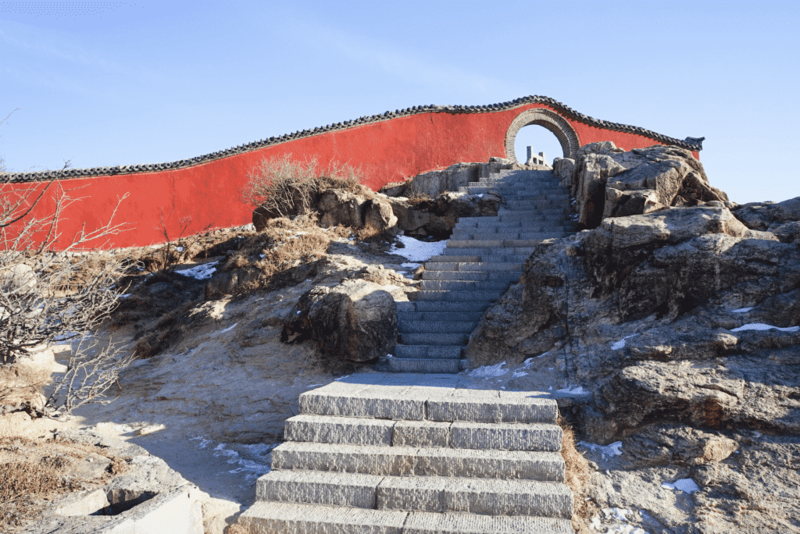 Guide to Climbing Mt Tai, The Most Sacred Of China’s Five Great Mountains! In my quest to as many UNESCO sites as I can in the world I came across an truly incredible place, Taishan Mountain China! Mt Tai (Taishan), located just to the north of the city of Tai’an, in Shandong province is famous through China as the most holiest of holy mountains but speak to any outside – even prolific travellers – and you are highly likely to be meet with a blank gaze. As with so many of China’s attractions, they thrive off domestic tourists and have barely a foreigner in site, but if you take the time to find and explore them you will be rewarded with rich cultural treasures and memories that last a lifetime. 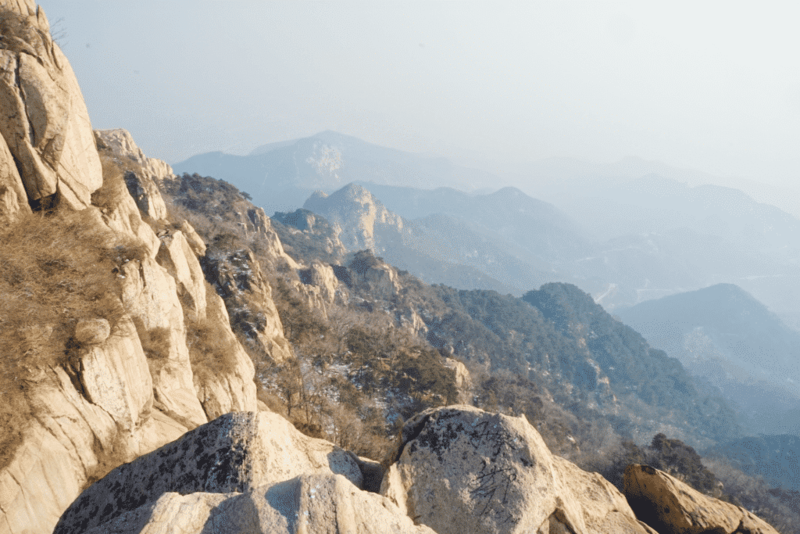 Read on for one such memory, my guide to climbing Taishan Mountain China. Oh and if you are not sold on China yet, be sure to check out these 16 Photos That Will Make You Want To Drop Everything And Go To China! Literally can’t believe Taishan Mountain China is not more famous in Western world….Its like being in heaven! Trust me – Everyone will be envious of your Mount Tai china pictures! 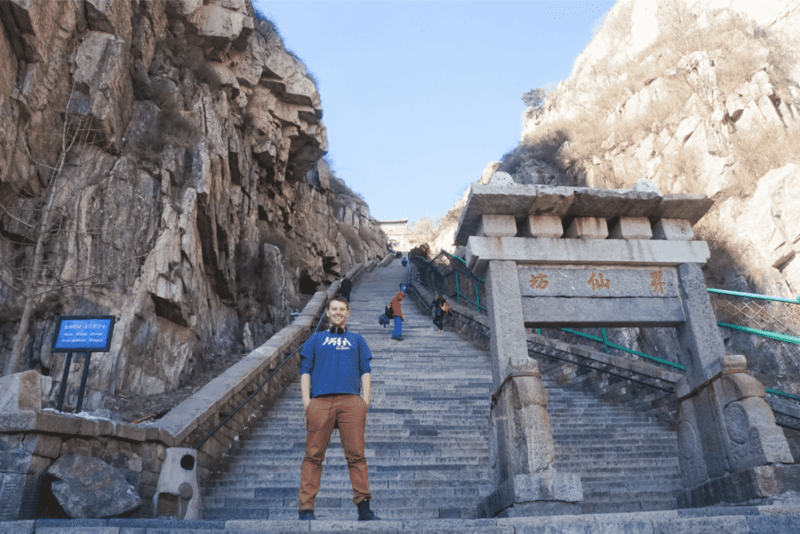 Legend tells if you manage to complete the Taishan mountain china climb you will live to over 100 years old, so I guess I am guaranteed a letter from the British Queen now right? Because I conquered this beautiful beast!Mt Tai is associated with sunrise, birth, and renewal, and is regarded as the foremost of the five Great Mountains of China. 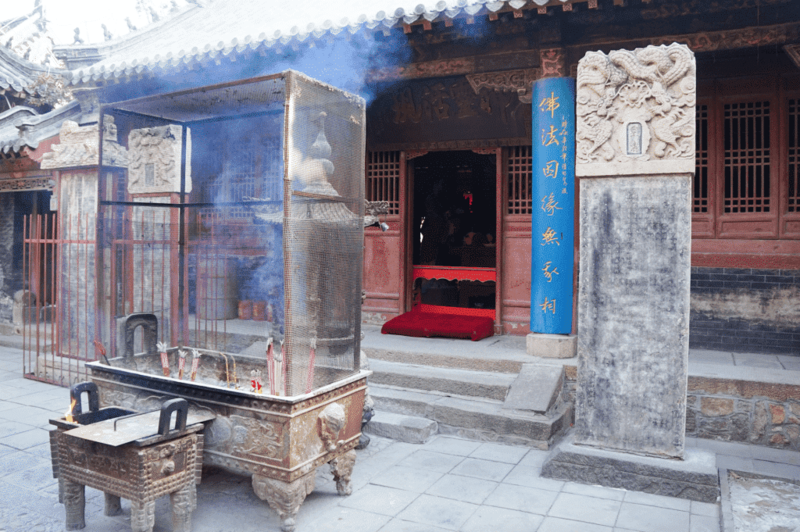 Mount Tai has been a place of worship for over 3,000 years and served as one of the most important ceremonial centers of China during large portions of this period, testaments of this history can be seen dotted all over the landscape. Like this Buddhist temple…Also a convenient excuse for a break when you legs won’t carry you anymore! No one said Taishan mountain china would be easy! 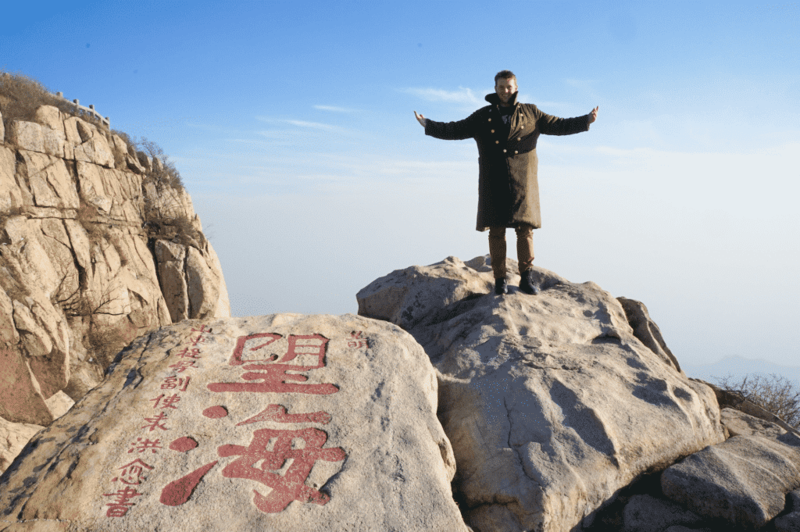 The Jade Emperor Peak is the ultimate goal here at Mt Tai, found after passing Half Way to Heaven and Heaven Gates, and at 1,532.7 metres (5,029 ft) above sea level it really is a sight to behold looking out into the clouds. Mt Tai has been a UNESCO World Heritage Site since 1987 and on top of its natural and cultural importance it is also widely known for its special ceremonies and sacrifices, Mt Tai has seen visits by many poets and literary scholars who have traveled there to gain inspiration. There are grandiose temples, many stone inscriptions and stone tablets with the mountain playing an important role in the development of both Buddhism and Taoism. They say the view from the top is always the best…I’d believe it! Even if your a novice photography your Mount tai china pictures are going to look amazing! Conquering Taishan mountain china UNESCO World Heritage Site was an amazing experience and I feel privileged to be able to do something like this, such a historic and spiritual place that was perfect for quite contemplation. 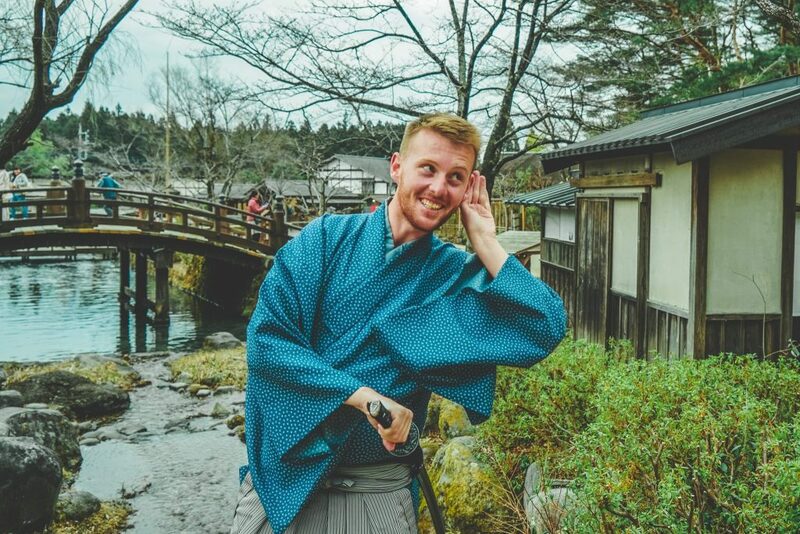 Well almost – I was chased by a evil Shitzu type dog until some shop owner helped me, and the sense of camaraderie between everyone was amazing! Most people couldn’t speak English (it is China after all) but we all managed to share laughs on the way up to hide the pain. Want to read more exciting stories? Try a Walking Tour on your next trip! Hong Kong Dog Cafe: A Unmissable Unique Experience at On Dog Dog Cafe! Macau Day Trip from Hong Kong: History, Gambling and Lights! 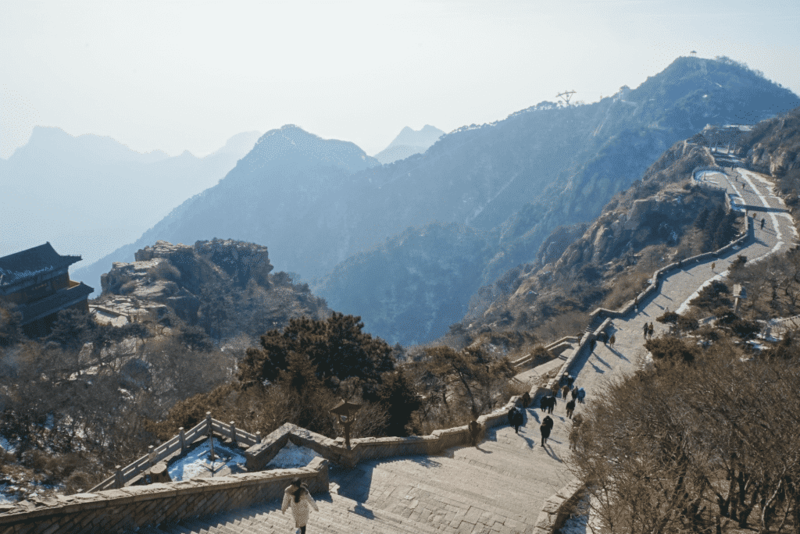 Taishan mountain china is just indescribable – So I won’t even bother trying and will just bombard you with all the Mount Tai China pictures I took instead! Most memorable, as always, is the people on China including two retired sister who insisted I sit and have lunch with them at the top and despite neither or us understanding each other we managed to have so many laughs, and grabbed the odd person who walked past to translate for us … They were from Guangzhou and was their first time seeing snow. By the time we had finished lunch we had an audience of 20! On the way down also made 3 new friends who spoke English (ish) too – Really people are just so friendly here! New BFF’s right here – Beautiful souls! 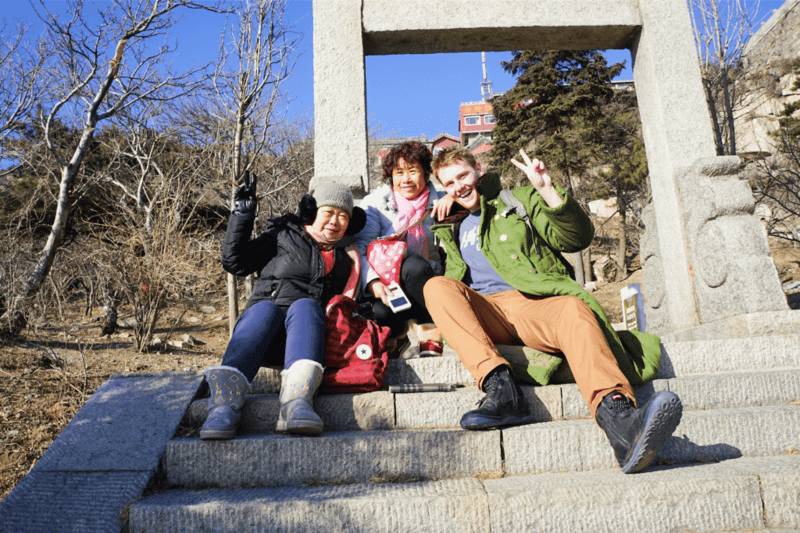 People like this are going to make your Taishan mountain climb memorable forever! Next time I really want to climb Hua Shan – another of China’s great mountains! For anyone in the area I highly recommend you check this out, it’s gruelling but highly rewarding in so many ways and like nothing I’ve ever experienced!! And if you think… ” oh thats too hard for me!”, trust me it isn’t. People of all ages were doing it and just taking there time, and really if you get completely stuck there is a bus to go up and is meet by a (rather pricey) cable car to the summit. So there is no excuse! Come and see why lies beyond for yourself…You will not regret it!